Do you need a suitable bus or minibus for a sightseeing tour in Burgenland or for a bus trip to Burgenland? Do you want to rent a coach or a minivan with a driver for a transfer in Burgenland or a transfer from / to Burgenland to / from a neighbouring region or country? Then you have come to the right place! Burgenland Bus is a co-operation between several renowned bus companies in Burgenland and in the neighbouring länder - Lower Austria, Styria - and countries - Slovenia, Hungary, Slovakia - led by the bus rental company City Tours which offers all kinds of sightseeing tours, excursions and transfers in Burgenland. 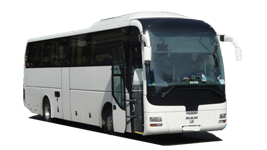 We can provide you with any kind of bus - 8-seat minivans, 20-seat buses, 60-seat coaches - and drive you quickly and safely to your destination in Burgenland or from Burgenland to your destination in Lower Austria, Vienna, Styria, Slovakia, Hungary or Slovenia. Both in Southern and Northern Burgenland you will find an incredibly big number of interesting places, which are all worth seeing for example during a sightseeing tour. Burgenland Bus would be glad to take care of the planning, the organization and the execution of tailor-made bus tours in Burgenland and to advise you as for the arrangement of private bus trips to Burgenland. Burgenland Bus can rent buses and minibuses with drivers not only for bus tours in Burgenland, but also for bus transfers in Burgenland - for instance to the Haydn Festival in the Schloß Esterházy ("Esterházy palace") in Eisenstadt, to the Mörbisch Festival on the Lake, to the Opera festival in St. Margarethen, to the theatre plays that take place in Kobersdorf Palace in July, or to the castles of Burg Forchtenstein, Burg Lockenhaus or Burg Güssing or the "Familypark" amusement park near Lake Neusiedl.
. The more details you include concerning the dates of your trip, the size of the buses you want to rent, the kind of travel and the route, the quicker we will be able to provide you with a personal offer matching your wishes. We are looking forward to hearing from you and will gladly advise you!